Cobra pilot Ross Teemer has killed for the CIA. Now he never wants to kill again. Love found on a beach will do that to a young man, even a Marine. But the father who haunts him, the CIA who needs him, and the Marine Crops who owns him, want on one more mission. Soviet pilot, Colonel Ivan Petrov, former advisor to the North Vietnamese, has left Soviet control to run his own operation out of Laos, and he knows why the CIA wants one more mission. Americans are so soft, so gullible. Sometimes a man must do what he's never wanted to do, and be what he's never wanted to be. Even if he's been betrayed, and even if he's on a one-way mission. "This is really a great story. Compelling characters, witty dialogue, a fast-moving plot . . . I got so involved I read it straight through. Highly recommended." "Crew has done it again. He has mined his experience and his technical expertise and produced a page-turner filled with golden nuggets of information, humorous characters, and stunning air-to-air scenes that will appeal to all. Randy was one of the pioneers in the days when Marine pilots like him were first experimenting with helicopter vs. helicopter tactics. He knew his subject then, and he knows it now." Just when you thought you knew all you needed to know about Vietnam, author Randolph Crew comes along and takes you to a place you’ve never been and on a ride you’ve never dreamed of. One-Way Mission is outside my normal genre, but I picked it up and couldn't put it down. A vivid, sensual experience, I smelled the engine exhaust, heard the hiss in the radios and the whine of the transmission, and I felt the rudder pedals vibrate on my feet with every burst of the guns. And I felt Lieutenant Ross Teemer’s sweat-soaked fear of the beast from the clouds, his love for Kim, his camaraderie with his friends, his heartbreak at the losses, and his sense of betrayal by those he trusted the most. I was left exhausted but totally satisfied from the experience. And enlightened. This is a fast-paced, great read with a cast of loveable and colorful Marine and Army characters—a crackling good, suspenseful yarn with a breath catching climax well told by a masterful writer. I strongly recommend you join Lieutenant Teemer on this ride. You won’t be disappointed. "One-Way Mission provides an intriguing look at a what-if scenario: Helicopter to helicopter dogfights over Southeast Asia near the end of the Vietnam War. Today, nearly 40 years after the last American aces made their records, Randy Crew's nicely developed scenario may remain the most likely prospect for aerial combat." "My God, what a story! A surprise in every chapter! You didn't let me down, Randy. It was fast, scary (very scary! ), and full of laugh-out-loud humor. And your crazy characters! Love those guys, especially Long John. Argh!" 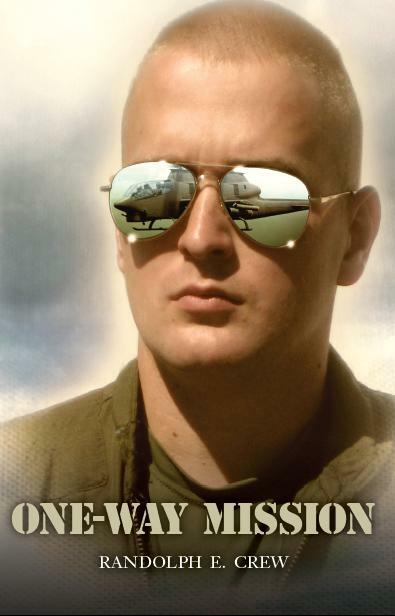 ONE-WAY MISSION is available at www.createspace.com/3489501 or www.amazon.com. On Amazon search "books," and "Randolph E. Crew." The man identified as Petrov looked to be about fifty. happy with one or both of them. He pulled another photo from the file, another 8 x 10. “Note the two new vertical scars on his left cheek. it looked metallic and black with rounded openings. Candles and bones and junk lay piled around its base. and they’re very loyal, but their loyalty is based on fear.